1. Create a summary of the chapter in your own words. 2. Comment on the study material. 3. 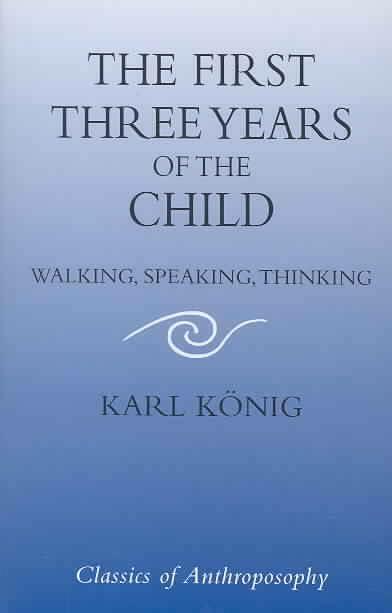 In chapter 1 part 5 Koenig gives a description of the stages involved in learning to walk upright. What are these stages? Do these stages concur with your own observations of the developing child and its learning to walk? 4. Create several drawings (pencil and paper) that show children learning to walk according to the stages described by Koenig. During the first three years of his earthly existence man acquires those faculties that enable him to become a human being. In the course of the first year he learns to walk, during the second he acquires speech, and during the third, he experiences the awakening of thought. He is born as a helpless infant and only by acquiring these three faculties of walking, speaking and thinking does he grow into a being who can name himself, gain free mobility and, with the help of speech, come into conscious communication with his fellow men in the surrounding world. A kind of threefold miracle happens because here is revealed more than instinct, more than adaptation, more than the unfolding of inherited faculties. The acquisition of the three fundamental human faculties is an act of grace that is bestowed on every human being. It is also a process of extraordinary complexity. Only a closer study of these phenomena reveals how manifold and varied are the ways in which the whole human being is woven into this developmental process. The following deliberations try to follow the traces on the path that leads to learning to walk, speak and think. A concluding chapter is concerned with how the interaction of these three fundamental soul faculties work into one another and are connected with the three highest senses: the senses of speech, thought and self or ego. The faculty of walking upright is part of the phenomenon of the whole human organization's faculty of movement, and it is quite one-sided to assume that we use mainly our legs and feet for walking. The entire bodily apparatus of movement is used for walking and the arms are engaged as much as the legs. The muscles of the back and chest are as intimately involved as are those that move the eyeballs. It is necessary to recognize that the whole human being is engaged in every movement he makes because the movement of one part of his body presupposes the state of rest of the other parts that are not actively engaged in this movement. During waking hours from morning until night, the resting condition of some parts of the body is never a passive but always an active function. This points to an archetypal phenomenon of all movement. If one part of the bodily apparatus of movement is in motion, then the remaining part is engaged in such a way that through an active state of rest the mobility of the other part is made possible. When I bend my arm, then I must, in order to make this flexion possible, not only actively relax the extensors of the arm in question, but all other muscles must form an active abutment to counter-balance this flexion. Thus, it is always the whole motor apparatus that takes part in every movement and helps in its performance. 1. The entire bodily apparatus of movement is a functional unity. Its elements never move as independent members but each movement occurs in the realm of the bodily motor system. 2. Therefore, the parts in motion show merely an apparent independence in contrast to those at rest. The resting parts, however, participate as actively in the process of movement as the parts in motion, even if this is not immediately evident. Recognition of the bodily motor organization as a functional unity has been prevented by the dominance of the concept of localization of the control of movement in the central nervous system. This is the result of the analytical method of scientific thinking of the nineteenth century and in our time would best be overcome. As little as single letters alone give meaning to the word, or single words the sentence, just as little does a series of single muscles move a limb of the body. The pattern of a movement uses muscles singly and in groups and so the movement is made apparent. Just as, when an opinion is stated, use is made of the sentence, which in turn takes its form from spoken words, so does gesture fall into single patterns of movement that call on groups of muscles to execute what the gesture demands. When I feel repulsion, various patterns of movement are at the disposal of this feeling. These patterns select specific groups of muscles from the whole motor apparatus and execute a movement with them in which the whole apparatus participates. Desire and repulsion, sympathy and antipathy, anger and anxiety, fear and courage, all have their corresponding forms of movement. More refined feelings and sensations such as listening and devotion, joy and pain, weeping and laughing also have gesture patterns at their disposal and service. When man learns to write or Weave, to carve, paint, hammer or forge, he has himself acquired movement patterns that are thus his own creation. These are not given to him as part of his heritage as a created being. The most fundamental of these acquired forms of movement, a gesture permeating the whole of human life, is the ability to walk upright. In standing erect man raises himself to a position that continually demands that he come to terms with the earth's gravity. The four-legged animal is in a greater state of equilibrium with gravity, but man must learn to stay uninterruptedly erect. He must not only rest freely in his uprightness, but also be able to move unburdened. How does he acquire this faculty that demands his constant personal involvement? The child's ability to move does not begin after birth but already exists during fetal development. From the end of the second month of pregnancy onward, movements of the fetus can be detected, and in the course of the fifth month they become so strong that the mother can perceive them. Controlled eye movements thus stand out from the general chaos of kicking movements even during the first days of life. This is the beginning, however, of the process of movement that will be completed at the end of the first year when the child has learned to walk. In learning to walk he acquires his first mastery over space. But the acquisition of this faculty proceeds according to a definitely ordered sequence that starts at the head and neck and gradually extends downward to the chest, arms, back, and finally to the legs and feet. Generally speaking, the child learns to master movements of the head and neck during the first three months after birth. During the second quarter, he controls lifting his arms and hands. These movements can be distinguished from the general kicking, so he can now be called, a little grasper. In this way, by the end of this period he has learned to sit freely. In the third quarter the child discovers his legs and begins to practice standing. During the last quarter he carries his ability to stand over into his first free steps and experiences his feet as organs touching the ground. The first conquest of space has thus been completed. The developmental process of movement, therefore, is shifted from the head down over the chest and legs into the feet, following a course through the body from above downwards. It becomes evident when we ask the meaning of this that it directly conditions the erect body posture. The head is the first member to withdraw from chaotic movement. Chest and arms are pulled along after it, and finally the legs and feet extricate themselves. This process seems to be patterned after that of actual birth. Just as in birth the head is the first part of the body to emerge and is gradually followed by the rest of the body, so here, out of the womb of dissociated movements, coordinated movement is born and oriented step by step toward standing and walking. At the end of the first year the process of the birth of movement is completed. With this achievement the head is directed upward and the feet touch the earth. The head acquires a position of rest, a fact to which Rudolf Steiner has drawn attention time and again, and is suspended lightly upon the shoulders, becoming the resting point around which the movement of the limbs can take place. The fundamental investigations of Magnus and de Kleijn (2) on the attitudinal and positional reflexes have shown the central position taken by the neck and head muscles in early development. The head takes an independent position of rest in order to make possible a free and harmonious mobility of the limbs. This applies especially to the ability to walk. When a human being can keep his head upright and still, he has also learned to walk. As long as an individual's head is restless and wobbly in the totality of movement, normal walking cannot be attained. After the first year the child also learns to free his arms from the action of walking and to use them independently. This happens because the head gradually becomes fixed and consolidated in its position of rest and is able to confront the free play of the limbs independently. The head, therefore, is a centre resting within the movements of the body. What has been said here can be summed up as follows. A child learns to walk in stages and gives birth to his motility from the head downwards out of the chaos of early movement. As a result, the head attains a position of rest as opposed to the free mobility of the limbs. Once an upright position has been achieved, the limbs must constantly come to terms with the gravitational forces of space because man, as an upright being, must be able to assume a freely mobile position of equilibrium rather than one that is fixed. It has been pointed out that coordination of eye movements is achieved immediately after birth when the child acquires the first rudiments of what later becomes his ability to look and the actions connected with it. The eyes learn to turn to definite points in the outside world. When we consider that in coordinating eye movements the first fixed point in the relationship between the soul and its surroundings is established, the fundamental importance of seeing as a human act becomes still more evident. It is by means of our eyes that we try to establish a conscious relationship with our surroundings even during the first days of our earthly life. This is not to say that the child can already perceive, but he begins to explore the surrounding world as it is gradually revealed by the "touch' of his gaze. In this way a first dull sensation of the "there in contrast to the 'self comes about. In the course of the first year the dull feeling will slowly brighten and gradually lead to the contrast between the sensation of his own body and that of the surrounding world, but the outside and inside, the there and the here, will still be completely interwoven. Adalbert Stifter has expressed this period of development in his autobiographical fragment as follows. Gradually the child's dull consciousness, which consists of merging sense perceptions and feelings, is lit up as the world becomes differentiated from his body. The process of differentiation, however, starts with the child's looking about. As his gaze gradually becomes fixed, the individual forms of the environment can be gropingly touched and grasped. Around the focus of looking, the head emerges as a structure belonging to the self. The baby learns to lift his head and to use it as an organ of orientation, turning it to where light, colour, sound or smell come to meet him. As time goes on, the child's eyes catch sight more often of his little hands and fingers playing and moving in front of them. When not only his eyes, but also his hands begin to grasp objects, holding and dropping them again, then the trunk, including arms and hands, stands out as a whole against the world. At this time the child has acquired the faculty of sitting freely and in doing so, he has already achieved a good deal. His head is suspended above his body and can be freely turned. His eyes begin to extend their gaze further into space while his hands grasp closer things and bring them to his mouth, etc. His hands now can also grasp the edge of the cradle. They can hold on to it, and he can pull his body up. Then the great moment occurs when, at about the end of the ninth month, the child pulls himself up by himself into an upright position for the first time. A decisive step has been taken in the separation of world and body. The surrounding world has separated itself from the child and it confronts the selfhood, which now comprehends the world as something alien. The new self, however, begins to move within this separated world by crawling, sliding and pushing. Every day and every hour new impressions appear, always quickly forgotten and always freshly conquered. The many new experiences demand to be seized, grasped, beheld and touched. Thus, the circle of forms coming into shape enters into action for the first time. The senses ask for mobility, and movement in turn conquers new sense experiences. At this time, this process is quite obvious. Space perception comes about at the end of the first year only because the child can experience the above and below by the development of his ability to stand erect. He has experienced what is near and far by his movements, the round and angular by his touch, and various positions in space by his gaze. But all this happens only because the process of separation between self and world had been completed. The child does not learn to walk by learning to bring certain muscular movements under control. He begins to control movements through a waking of consciousness that gradually brings the body to stand out from its environment as a separate self. The delivery of the body from the intimate embrace of its mothering environment leads to the ability to walk erect. Walking erect is not a simple process of movement that makes locomotion possible. Learning to walk reveals a process of developing consciousness that leads to the perception of the environment as something 'outside. The process begins with "looking, continues in grasping and culminates in walking. 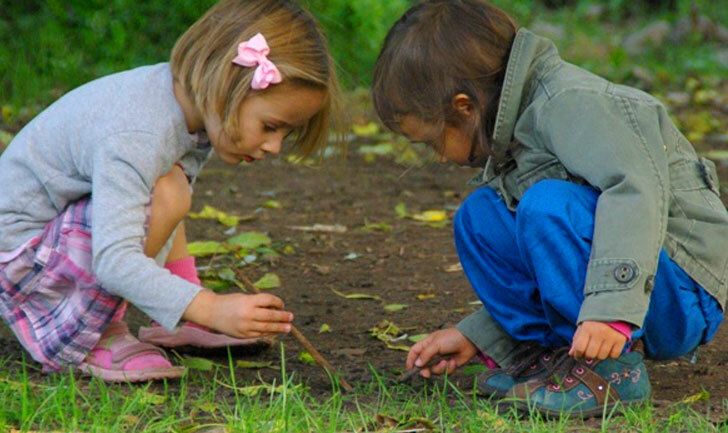 The awakening consciousness that enables the child to comprehend his own self at the end of the first year moves from the gaze of the eye over the grasp of the hands to the step of the feet. The inner meaning of walking can only be understood when we see it in its entirety. We can walk upright because it is possible for us to develop from creatures woven into the world fabric to individual beings confronting the world. As a result of important investigations, Portmann has pointed out that the first year of human life is of special significance in that the development that takes place in humans during this period occurs in other mammals within the uterus. Setting this first year apart from the later periods of the child's development, he calls it the "extra-uterine spring season. He says, "The newborn child can be called a "secondary" nestling because, considering the extent of his development, he is really a fledgling without, however, having acquired a fledgling's free mobility.' (5) The extent of man's development at birth indicates his special position in the realm of the living. Portmann somehow divines these inherent evolutionary problems. Portmann also quotes Stirnimann's investigations, which must be considered in relation to the findings mentioned earlier concerning the positional and attitudinal reflexes of the child. These are known to be spontaneous activities of the newborn child that occur in response to certain circumstances of stress. Thus, the child shows that it is possible for him to stand, crawl and walk during the first months. These incipient faculties, however, are lost by the fifth month, thereby making it possible for him to achieve proper Crawling, standing and walking from the ninth month on. To be prepared to stand, one must possess the ability to place his limbs in the standing position. To demonstrate this in the newborn child different parts of the body surface or the eyes must be stimulated. Held upright, for example, even the newborn child tends to stretch his legs when the soles of his feet come in contact with a firm surface. He does not yet show any clear readiness to stand, however, but is only capable of performing the action when his legs have been brought into the proper position. During the second quarter of the year, a readiness to stand occurs when the upper part of the child's foot is touched. When, for example, he is held upright so that the upper part of his foot touches the lower edge of a table-top, he will bend first one leg and then the other. Then, putting the sole of his foot on the table, he will straighten his leg out and will finally stand with both feet on the table. ... It is possible to induce reflex walking movements in all normal, healthy newborn babies. To demonstrate this, the child is held around the waist with both hands, and is stood upright on a firm base. Certain supporting reactions in the legs result. If his body is now tilted slightly forward, he will make proper walking movements and take steps if he is moved in keeping with them. He will have a tendency to cross his legs, but nevertheless steps of about four inches each will be taken. In the course of further development, around the end of the first six months, these walking movements recede into the background and so cannot be said to represent an immediate preparatory step to true walking. ... J. Bauer has described something similar as a crawling phenomenon. If one puts a small baby bellydown on a table and supports the soles of his feet with his hands, the baby begins to crawl by pushing himself away from the supporting hands. The arms are lifted and placed forward one after the other, and in this way the child can be made to crawl across the table. According to Bauer, the crawling phenomenon occurs only in the first four months and then only when the child lies on its belly. In these quotations is characterized the three most important achievements of spontaneous movement in the child that occur before he acquires the ability to stand and walk upright. It is of the utmost significance to the proper course of later development that these movements appear during the first months after birth and then disappear, thus making possible their reappearance later in a completely new metamorphosis as Crawling, standing and walking. Without referring to the particular investigations mentioned above, O. Storch has reported two forms of movement that he calls "inherited and acquired motor movements' (Erbmotorik und Erwerbsmotorik). 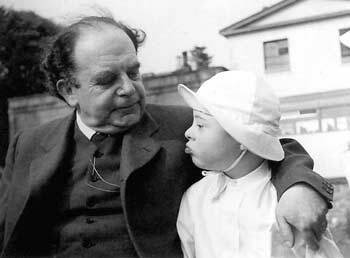 (6) Although in the case of the child one can hardly speak of inherited motor actions being manifested during the first months, congenital movements must nonetheless be differentiated from those acquired by learning, of which walking is the most important. In the course of the first months these choreatic-athetotic movements pass over into general kicking, which in turn is gradually overcome so that by the end of the first year walking has been learned. Athetotic children, however, who because of certain brain injuries do not learn to walk or do so only with difficulty, show symptoms that clearly and unequivocally point to the forms of movement just described. A child with the characteristic symptoms of Little's disease shows the same pes equinus position and the tendency to cross his legs when trying to walk. Thus, in these children, the movements of early childhood described above continue into later life and present the symptomatology of grave motor disturbances. Such abnormalities cannot be overcome because walking as an acquired motor activity cannot redeem the persisting inherited movements. Children who cannot develop the reflexes of position and attitude show the crawling phenomena described above. This group, whose disturbances belong to the forms of cerebellar ataxis, remain crawlers throughout life because they cannot acquire the ability to walk upright owing to the failure of their sense of equilibrium. The so-called athetotics retain the forms of movement associated with premature birth and these then lead to serious disturbances of posture and movement. 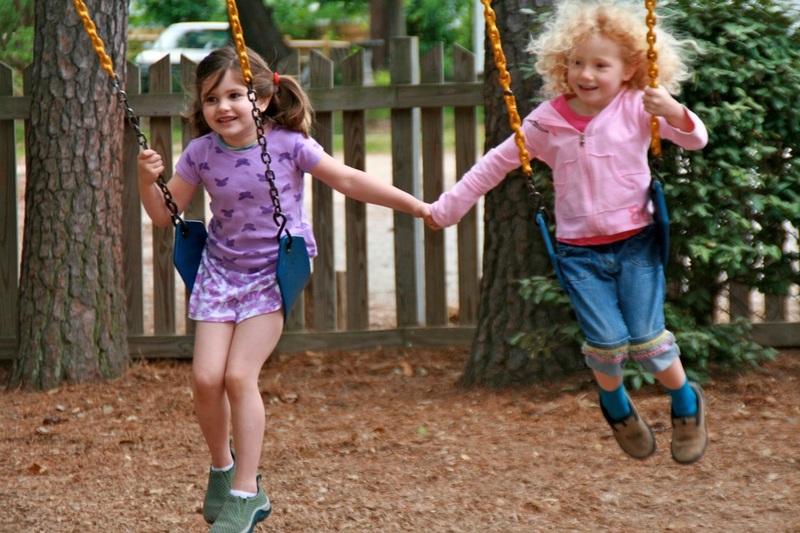 Here, above all, the directed and ordered movements are disturbed, but the ability to walk upright can be acquired gradually by quite a few children in this group. In athetotic children the range of motor disturbances is not a pathological condition that arises anew. 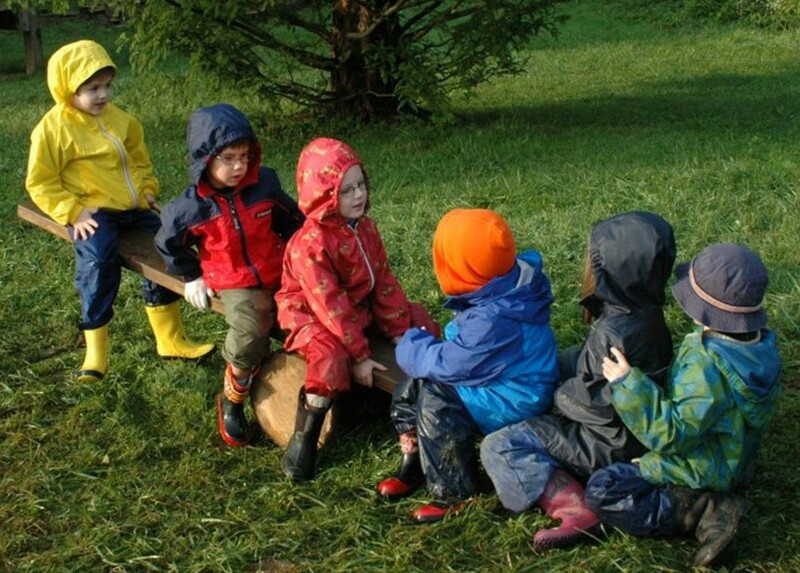 These disturbances are rather the physiological remnants of the behaviour patterns of early childhood. The inability to learn to walk upright is common to all of these children because of the retention of early movement patterns that later assume disproportionate dimensions. What has been described earlier in this chapter as the birth of walking out of the chaos of general movement cannot be accomplished by them. A retardation is also shown in the general attitude of these child patients. The lighting up of consciousness that follows the differentiation between self and world, or between body and environment, while walking is being learned, does not take place. The athetotic child can hardly master his feelings and suffers from an erratic, unruly occurrence of laughing and weeping that is beyond his control. The behaviour of those children who cannot attain positional and attitudinal reflexes also shows that they cannot retain sense impressions. The development of memory occurs only involuntarily, and they are hardly able consciously to call up memories at the right occasion. From these brief indications it can be seen how fundamentally important walking is for the soul-development of man. If walking fails to develop, then the control of feelings and moods is missing, the conscious use of the faculty of memory is lacking, and separation of self and world is not achieved. If we did not learn to walk, further development of the conscious unfolding of the specific human faculties in the course of childhood would not be possible. The way leading to school is in reality open only to those children who can go walking upright. For the others, measures of curative education can compensate for what they have had to forego in the development of the first year even though learning to walk, as an act of grace, could not become manifest in them. If, in an understanding of the uprightness of man, one does not include the observations touched upon here, then the following remark of Portmann can be readily understood. "The true meaning of the slow development of the completely upright position of the body, and the bodily structure basic to this position, can still hardly be grasped.” Only he, however, cannot grasp it who looks at man's ability to walk upright as simple locomotion and lacks the courage to admit the fundamental difference that exists between the upright position of man and that of the higher animals. Endowed as they are with a horizontally oriented spine, the animals remain part of the world. They are overwhelmed by sense impressions and the abyss between self and world does not open. In them the head is not carried above the spine as if floating, but remains incompletely differentiated as a continuation, not yet a separate creation, at the anterior end of the body. Memory pictures, therefore, can only be retained, but not recalled. Pleasure and displeasure, greed and disgust, constantly changing, flood the inner experiences. The upright posture alone causes the abyss to open between self and world, and this leads to the further acquisition of speech and thought. The ability to stand, the reflex walking movements, crawling and the athetotic movements of premature births differ fundamentally from the new phenomenon of walking. They must disappear in the course of the first year to make walking possible. Whether these archetypal movements are called inherited or congenital or whether they are attributed to activities of certain nerve centres of the cerebrum or cerebellum, is not as important as to recognize the entirely new impulse brought forth in the acquisition of walking. From the development of looking and grasping on to the acquisition of walking, a new power unfolds, opposing all biological processes. This force first takes hold of the eyes, bring the axes of sight into line, and thus makes possible the fixation of the gaze. It directs the arms and hands of the body toward purposeful movements, and the hands learn to grasp, to fold and to hold each other. Finally, the soles of the feet touch the ground. From the heels to the toes they enter the field of gravity - something that does not happen with any animal- and the head is lifted, reaching into the light. In this picture of the upright position is presented the polarity of light and gravity. Thus a new element enters that must be realized as the member of the human being that can be attributed only to man and to no other creature on earth. Rudolf Steiner calls this entity, I.' Through his 'I' every human being can receive the gift of grace of walking. When it appears in the form of uprightness, all other forms of movement recede and disappear. It is as if the shepherd enters among the herd, and the herd then grows quiet and restful, gathering around him. In this way, all other forms of movement arrange themselves around the power of uprightness, which, in the moment it appears, brings order and guidance with it. Now that we have attempted to approach those phenomena connected with the acquisition of the upright walk in a special way, a strange conformity to law is revealed during this period that should be mentioned. It can hardly be mere chance that it takes approximately a year to learn to walk and that development that is premature or retarded is expressed symptomatically as a disturbance in the unfolding of the child's being. To learn to walk takes the same amount of time as that required by the earth to circle the sun, which suggests that this sun-earth rhythm is inscribed in this human faculty. Rudolf Steiner has pointed out that man acquires his uprightness here on earth as something entirely new. "It is significant, he says, "that man should have to work upon himself in order to make a being that can walk erect out of one that cannot walk at all. It is man who gives himself his vertical stance and his equilibrium in space." (8) This earthly acquisition of the ability to walk is placed in the cosmic time relationship between sun and earth. 1st month: The child's eyes begin to fix their gaze. 2nd month: Even when lying belly-down, the child begins to hold his head upright. 3rd month: When placed belly-down, the child can lift his shoulders together with his head, and keep them elevated for a time. 4th month: When placed belly-down, he can support himself on the palms of his hands. He grasps a new situation with active gaze. He begins to reach for objects that he has found by touch. In the act of grasping he can bring both hands together without using his fingers. 5th month: While lying on his back, he can lift his head and shoulders. He has learned to turn from his back onto his side, and he is also able to grasp with his hands objects he has seen. 6th month: The child is able to sit up with support. He can bring a movable object into contact with a resting one. He can, for example, beat rhythmically with a spoon upon a table. 7th month: The child begins to move away from a position of rest. He tries to get desired objects and to reach them by changing his position. 8th month: He now sits independently and begins to crawl. 9th month: The child learns to raise himself to a sitting position without support. He learns to kneel and begins to stand with support. 10th month: He is able to throw things. 11th month: The child can raise himself and stand by holding on to something. 12th month: He can stand freely and with a little help and support take his first steps. If one reads this calendar of the first year not only as a schema showing the 'intelligence' of the growing baby, but also tries to live through what happens, then these twelve months become the true course of a year in which the acquired faculties stand out individually like festivals. Rudolf Steiner has said that in earlier epochs of human evolution birth always took place during Christmas time. (9) This remained so up to the third millennium BC, especially among the North Germanic tribes. Births only gradually began to spread out over the whole year. Thus it was formerly true that children first saw the light of the world at a definite time of the year. Gradually, in the course of the further development of mankind, this link with nature was abolished. Accordingly, learning to walk in former times was accomplished in the year between one Christmas and the next and, as if into the milestones of incarnations that remained from this, the various festivals were inscribed. These were celebrated first as pre-Christian and later as Christian festivals. While the following correspondences cannot be 'explained' in the ordinary sense, it is left to the individual to try to experience the connections resulting from them. It may be significant that the baby smiles for the first time and can lift his head from the horizontal just at the time when the festival of the presentation in the Temple, Candlemas, is celebrated. At Easter, the baby learns to hold up his head and shoulders while on his belly; he raises himself so to speak above the water. He reaches for objects, answers a look with a smile and touches things. His arms are freed. Around Whitsun, he can grasp an object he sees and thus coordinates his hands and eyes. He can turn from a back to a side position, freeing himself from the base on which he lies. At St John's tide the child sits up. Now the sun stands at the highest point of the heavens, and as a human being, the child holds his head freely above his horizontal shoulders. At Michaelmas he sits up by himself and learns to kneel and to standby supporting himself. At the beginning of Advent, the child puts himself freely into space, and by Christmas he can take his first, hesitant steps. Now a creature is on his way to becoming a creator. These hints have been given to help those who seek a new understanding of man, not to open the gates to mystic speculation. We should practice such thoughts and cultivate the feelings arising from them especially when watching children to whom the ability to walk has been denied. Then a new power to help will call forth the will and bring help where help is otherwise denied. In every child who learns to walk today these words are at work: Arise! Take up thy bed and walk!' It is the sun power that raises the earthly body of man so he can walk erect over the earth. Stern, Psychology of Early Childhood, p. 69. Stern, Psychology of Early Childhood, p. 124. Storch, Die Sonderstellung des Menschen. Portmann, Biologische Fragmente, p. 72. Steiner, Karma of Untruthfulness, lecture of Dec. 21, 1916. Binswanger, L. Ausgewählte Vorträge und Aufsätze, Vol. 2. Bern 1955. Brock, J. Biologische Daten für den Kinderarzt, Vol. 2, Berlin 1934. Bühler, K. The Mental Development of the Child. London 1930. Busemann, A. Erregungsphasen der Jugend,'Zeitschrift für Kinderforschung, No. 33. 1927. Conrad, K. “New Problems of Aphasia, Brain, Vol. 77, 1954. Gehlen, A. Der Mensch. Seine Natur und seine Stellung in der Welt, Bonn 1950. Hamann, Des Ritters von Rosencreuz letzte Willensmeinung. Hansen, W. Die Entwicklung des kindlichen Weltbildes, Munich 1949. Homeyer, H. Von der Sprache zu den Sprachen, Olten 1947. Kainz, F. Psychologie der Sprache. Vol. 2. Stuttgart 1943. Köhler, E. Die Persönlichkeit des dreijährigen Kindes, Leipzig 1936. Köhler, W. The Mentality of Apes, London/New York 1927. König, K. Die Geistgestalt Helen Kellers,' Das seelenpflege-bedürftige Kind, Vol. 3, No. 1, 1956. König, K. “Der Motorische Nerv wird entthront. Die Drei, No. 1, 1955. König, K. “Die Nerventätigkeit kann nur durch eine Methode der Ausschliessung erfasst werden,' Beiträge zu einer Erweiterung der Heilkunst, No. 3/4, 1955. Kroetz, C. Allgemeine Physiologie der autonomen nervösen Correlationen, Handbuch der normalen und pathologischen Physiologie, Vol. 16, No. 2, Berlin 1931. Magnus, A. & de Kleijn, A. Körperstellung, Gleichgewicht und Bewegung. Handbuch der normalen und pathologischen Psychologie, Vol. 15.1, Berlin 1930. Novalis, Hymns to the Night, Translated by Mabel Cotterell. 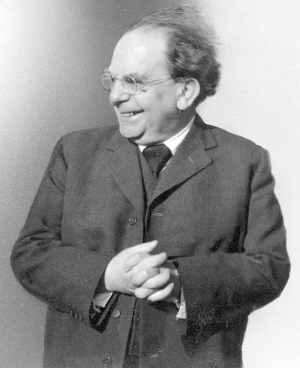 Portmann, A. Biologische Fragmente zu einer Lehre vom Menschen, Basel 1944. Porzig, W. Das Wunder der Sprache, Bern 1950. Preyer, W. Die Seele des Kindes, Leipzig 1900. Rauch, K. Der Schatten des Vaters, Esslingen 1954. Reichard, H. Die Früherinnerung, Halle 1926. Remplein, H. Die seelische Entwicklung in der Kindheit und Reifezeit, Munich 1950. Scheler, M. Abhandlungen und Aufsätze, Vol. 1. Leipzig 1915. Schmitt, A. "Helen Keller und die Sprache, Münstersche Forschungen, No.8, Münster 1954. Sigismund, R. Kind und Welt, Braunschweig 1897. Steiner, Rudolf. Anthroposophy (A Fragment), (Translated from German Complete Works (GA) No. 45), Anthroposophic Press, New York 1996. Steiner, Rudolf. Building Stones for an Understanding of the Mystery of Golgotha, (GA 175), Steiner Press, London 1972. Steiner, Rudolf. The Foundations of Human Experience, (formerly Study of Man), (GA 293), Anthroposophic Press, New York 1996. Steiner, Rudolf. Die geistigen Hintergründe der menschlichen Geschichte, (GA 170), Steiner Verlag, Dornach 1978. Steiner, Rudolf. The Karma of Untruthfulness, (GA 173), Vol. 1, Steiner Press, London 1988. Steiner, Rudolf. Metamorphoses of the Soul, (GA 59), Steiner Press, London 1983. Steiner, Rudolf. The Realm of Language, (from GA 162), Mercury Press, New York 1984. Steiner, Rudolf. The Renewal of Education, (GA 301), Steiner Schools Fellowship, Forest Row 1981. Steiner, Rudolf. Spiritual Guidance of the Individual and Humanity, (GA 15), Anthroposophic Press, New York 1992. Steiner, Rudolf. Von Seelenrätseln, (GA 21), Steiner Verlag, Dornach 1983. Steiner, Rudolf. Weltwesen und Ichheit, (GA 169), Steiner Verlag, Dornach 1963. Steiner, Rudolf. The Wisdom of Man, of the Soul and of the Spirit, (GA 115), Anthroposophic Press, New York 1971. Steiner, Rudolf. Die Wissenschaft vom Werden des Menschen, (GA 183), Dornach, 1967. Steiner, Rudolf. 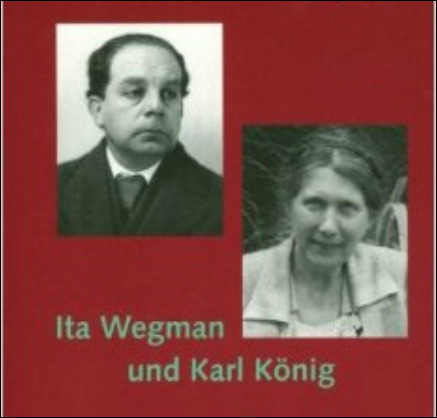 World History in the Light of Anthroposophy, (GA 233), Steiner Press, London 1977. Stern, W. Psychology of Early Childhood, 2 ed., London 1930. Stifter, Adalbert, Betrachtungen und Bildet, Vienna 1923. Stöhr, Mikroskopische Anatomie des vegetativen Nervensystems, Berlin 1928. Storch, O. Die Sonderstellung des Menschen im Lebensabspiel und Vererbung, Vienna 1948. Treichler, R. Von der Welt des Lebenssinnes, Beiträge zur Erweiterung der Heilkunst, No. 7/8, 1952. Valentine, C.W. The Psychology of Early Childhood, London 1947.